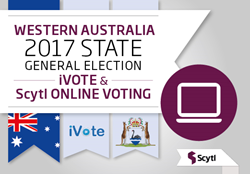 The Western Australian Electoral Commission has used Scytl technology through the iVote online voting system to enable technology assisted voting for the March 2017 State General Election, becoming the second state in Australia to benefit from the secure and accessible online voting channel. We are thrilled to have been selected to once again help Australian citizens benefit from the advantages online voting technology provides disenfranchised voters and help Australia continue to stay at the forefront on innovation. The Western Australian Electoral Commission (WAEC) is utilising Scytl technology through the iVote application for the deployment of technology assisted voting for the March 2017 State General Elections. In accordance with the Electoral Amendment Act 2016, electors who cannot vote without assistance due to insufficient literacy skills, sight impairment or other incapacities will be able to vote via the internet or by telephone – enabling them to register, cast and verify their vote privately and securely. Western Australia becomes the second state to implement online voting technology with the clear intent to make elections more secure and accessible for disenfranchised communities. Given the high profile public environment in which the WAEC conducts its business, the solution selected was based on the demonstrated abilities for the development, integration and operation of internet enabled election management systems in addition to the capacity and proven ability to provide technical and customer support both prior to and throughout the election voting period. The solution has leveraged a customised version of the New South Wales iVote Core Voting System (the iVote CVS) deployed by Scytl in the 2015 New South Wales State Election. Scytl Online Voting technology has been tried, tested, and proven to be as secure, and in many cases more secure, than traditional paper and postal channels. As internet enabled technology matures, leaders across the globe are looking to online voting to help manage elections more efficiently and securely. “We are thrilled to have been selected to once again help Australian citizens benefit from the advantages online voting technology provides disenfranchised voters and help Australia continue to stay at the forefront on innovation,” says Pere Valles, CEO at Scytl. Scytl is the global leader in secure online voting and election modernization solutions. Scytl has capitalized on its more than 20 years of research to develop election-specific cryptographic technology that offers maximum security and is protected by more than 40 international patents. Over the last 10 years, Scytl’s electronic voting and election modernization solutions have been successfully used in 47 countries across the globe, including Australia, Canada, France, Norway, Switzerland, the United Kingdom, the UAE, South Africa, India, and the United States. Scytl is headquartered in Barcelona, Spain, with offices in over 20 countries. For more information, visit http://www.scytl.com.